The Devil's Work.shop asset pack contains one hero, with 6 animation cycles for various actions. The pack also comes with 4 enemy types with a bunch of animation cycles, a hand full of props, and layered background art. Not to forget the UI kit with 9 slice buttons, HUD elements, and game over title. The asset can be easily imported into Unity or an open-source game engine like Superpowers. These assets were originally made for 32nd Ludum Dare, and now it's free available for your hop-and-bop side-scroll project. The assets are free and not licensed to any commercial project. Tried and Tested in: Unity 5+, Adobe Animate, Construct 2, Stencyl, Game Maker. Love the art! I started working on a little game using the pack. I should have more soon and something to play before too long. 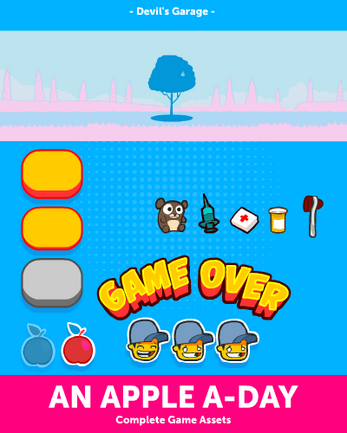 I would love to be able to add multiple apple types like an explosive apple or a robot apple with matching outfits or hats for the hero. I am thinking of putting the projectile dr. on a car launching apples as he drives by and i still need to add the flying enemy. I am not much of an artist so anything you can add would be amazing! If you can think of something you would like to see in the game i would love to add it! I Love the new art! I should have something to play this month, probably by next week or so. I am able to focus some time this month! here is where we are.